Shaft mounted fluid couplings with a V-Pulley attached is another common way to install a fluid coupling on to a drive. We have two different designs available to suit your drive requirements. Some are even kept in stock for a fast delivery time. HD-P fluid couplings are for belt drive and are offered in different executions with and without delayfil chamber. 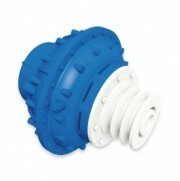 These couplings can be supplied with or without a pulley. 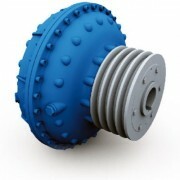 This provides flexibility for use of pulleys of different specification on the same coupling. Standard fusible plug blow off temperature is 130 degrees C.
SMP are fluid couplings for belt drive offering a wide range of pulley diameters (Pulleys fitted at Fluidomat). Have an in built delay-fill chamber enabling quick decay of motor starting current as motor accelerates to 90% speed faster.